Both Gerd and Hans Jürgen spent a year attending an international school in St. Moritz, Switzerland. 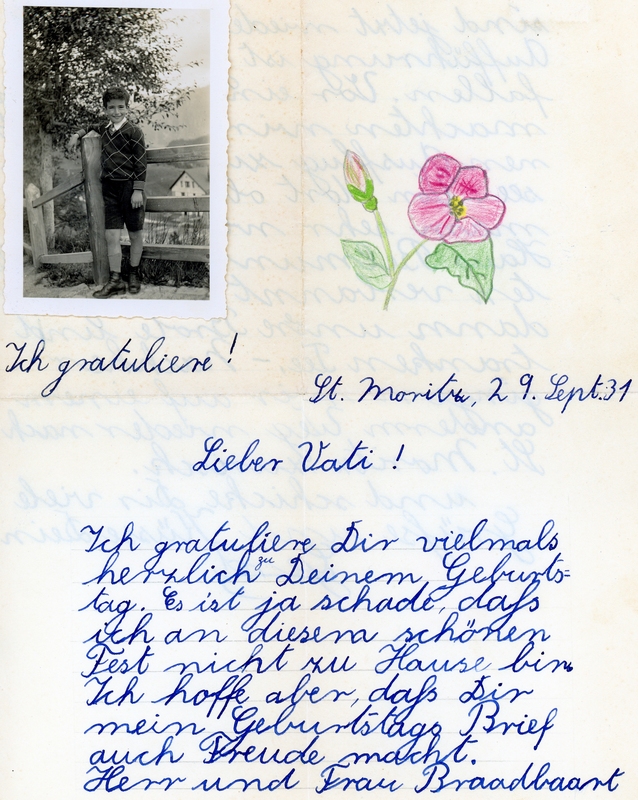 Henriette saved every letter written by both of her sons during their stay in Switzerland. In this letter Gerd is wishing his father a happy birthday. My grandfather (pictured in the upper left) always described his father as stern, almost emotionless. This letter, along with the hundreds of other letters, really starts to alter my perception of Oscar. My hope, after intensive translation, is to construct a more accurate portrait of Oscar and Henriette. That’s an interesting form of double-s ending the third full line of the note, I’ve never seen one like that before. Fabulous collection of memorabilia, we should all be so fortunate.